Clear skies. Low around 40F. NNW winds at 15 to 25 mph, decreasing to 5 to 10 mph. Higher wind gusts possible..
Clear skies. Low around 40F. NNW winds at 15 to 25 mph, decreasing to 5 to 10 mph. Higher wind gusts possible. Director Roxann Dawson, Actor Marcel Ruiz, Actress Chrissy Metz, Producer DeVon Franklin, Joyce Smith, Jason Noble, John Smith. Photo courtesy of SSM Health St. Joseph Hospital. At a special movie premier for “Breakthrough” was Dr. Kent Sutterer (right), the doctor who treated John Smith (left) at SSM Health St. Joseph Hospital after EMTs brought him in for treatment. Photo by SSM Health St. Joseph Hospital. 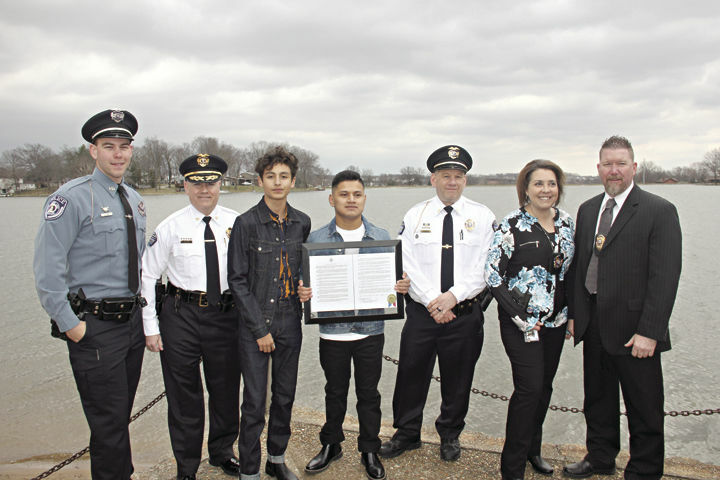 Waves of members from a half-dozen local first responder and medical organizations rimmed the shore of Lake Sainte Louise on March 20, four years after Lake Saint Louis teen John Smith fell through the ice. On April 17, a movie - “Breakthrough” - will release to theatres telling the story of Smith’s ordeal, how he was unconscious and underwater for over ten minutes before being rescued by local first responders. The March 20 event was put on by the movie’s promotional company for Smith’s family and the numerous first responder agencies that participated in his rescue. Included in the crowd were representatives from the Lake Saint Louis Fire Protection District, the Wentzville Fire Protection District, the St. Charles County Ambulance District, SSM Health St. Joseph’s West Hospital, the Lake Saint Louis Police Department and the Lake Saint Louis Community Association – all groups and people that helped with the rescue and helped ensure the story had a happy ending. “Unfortunately for the movie, they have to sum it up, they have to put it all together,” said Lake Saint Louis Firefighter/Engineer Joe Morrow. “They put me on a Wentzville truck, instead of using Lake Saint Louis’s truck…as the responder we don’t want to see anyone left out of the story, because it was everybody. There’s only two of us in the water, but there’s people working our ropes, there’s people working the radio, there’s people doing interviews, the cops were there doing their stuff. The event was to prop up everyone involved in the rescue, and Lake Saint Louis Police Chief Chris DiGiuseppi said it was a good day of celebrating the community and remembering the events from January of 2015. Looking back at the accident, the rescue and the events that follow, Morrow said it means a lot to the first responders that the situation resolved as it did. As a man of faith, Morrow said it confirms his belief, and it also tells him not to ever give up on trying to save someone. Morrow, who was one of the firemen who pulled Smith from the ice, said that at the time the Lake Saint Louis Fire Protection District had been at one of the old stations on the right side of the lake, which helped get them there sooner. One girl and two other boys had been out with Smith when the ice broke, and all three boys went in. One of the boys had self-rescued, and the other had been in the water, but above the surface as first responders hit the scene. As Morrow says, things began to line up in the rescue attempt. The boy on the surface was rescued, and an underwater search began immediately. Wentzville FPD arrived with poles to search under the water, and Wentzville’s Tommy Shine got in the water with Morrow and Mike Terranova, and the three started searching below the ice. A truck captain for Lake Saint Louis, Justin Darnell, had interviewed people from the Community Association, which put them “almost dead-on” to where Smith went under. Even more lucky was how quickly the three firemen found Smith. “Me and Tommy, we started searching with the poles – I think he went left, I went right, and within like a minute, maybe even less, he said ‘I think I have him,” Morrow said. The local lakes are usually mud bottom lakes, but miraculously the place they were searching for Smith had a rocky lakebed. The search poles make a distinct sound when tapping rocks, compared to mud. “When it hits mud and then it hits a body, it’s hard to tell the difference,” Morrow said. The firefighters were able to get Smith out of the water and pass him on to the EMTs that arrived. Despite the long time underwater, Smith regained a pulse and eventually, recovered fully in spite of the fears of all involved. “The outcome with this incident has been unlike any other that I’ve experienced,” DiGiuseppi said.